Entertain for Less but Keep the Fun! Going out with friends can get expensive. How about some new ways to cut costs but still have a great time? Brunch can be fairly inexpensive to give with you providing all the food, but it’s easier to do with everyone bringing something. On a Sunday, you might ask people to bring their Sunday newspapers if they have them. I like this kind of get together because it’s very relaxing. You can start a gaming night to play cards or board games. Keep it simple & serve just dessert & coffee. Or do snacks/appetizers & drinks. A fun party is the traveling dinner. Each person/couple makes one course for the meal. The first house serves appetizers & drinks; the next house serves soup or salad with beverages. The main course is at a third house & dessert is at the last house. You can choose themes for these dinners by making a particular country’s cuisine or just picking fun themes. A wine and cheese tasting party is a fun way to try new wines. Each guest brings a bottle of wine of the type chosen like pinot noir or merlot, etc. The host provides the cheeses and small slices of crusty bread to cleanse the palate between tastings. Cover the label of the wine & give it a number. Cheese cubes with a number near the plate and bread pieces are set by each bottle of wine. The host provides small glasses (usually plastic) for tasting the wine. Pour just a little into each cup. Provide guests with paper & pen to make notes. Everyone votes on their favorite wine & favorite cheese. Wines & cheeses are then identified & winners announced. Serve coffee and dessert so that people will be sober to drive home. This can also be done with beers. 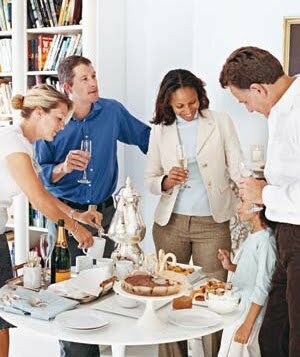 I hope this gives you some ideas to cut your entertaining expenses & still have fun! Click any of the labels below this post for recipes and party theme ideas. Of course there’s nothing wrong with a movie night at home either! Update: I forgot barbeques! Thanks Travis for reminding me!!! A BBQ/cookout can be very affordable & is lots of fun. Also tailgating and game day parties are great. Make it a potluck to be easier and cheaper! What a great idea to do brunch for showers! I think a lot of people would like that & as you say the day is not totally gone afterwards! And it’s cheaper, even though it doesn’t seem so. Clever! Thanks for the great idea, Super Frugalette! I love to do brunch for showers. It is cheaper and it still leaves the guests with plenty of time in their day to do other things. A 1pm wedding or baby shower means that you are spending the entire day at the shower. Ding, ding, ding, Marie, you win the prize! You came up with a way to get together in a way that no one has to clean their house! Isn’t that one of the reasons people meet at a restaurant or bar? Who has time to clean the house with work, kids, etc. OK, there are picnics and tailgating while the weather is still decent. What about in the winter? Ice skating, sledding & meeting nearby for a hot chocolate? Could work. If you meet in a park or at an event it can be even better, because then you don’t have to clean house! Squirrelers, I love potlucks. It’s a great way to find new recipes & it’s fun to try various cuisines. You can always organize a potluck with your friends &/or family! With so many holidays coming up it’s easy to find themes too. Big potluck dinners can be a lot fun. Making them themed can add to it. It’s been a while since I’ve been to one, but around 4 years ago I attended a Spanish-themed potluck that was a lot of fun. Tried different things, some good some not so good. But it was an excuse to get together and do it cheaply. Hi, Travis! How could I forget BBQ? The shame of it all! We always called it a progressive dinner too, but I was worried people would think it had to do with politics. For the wine & cheese tasting you can set a limit on the cost of the wine if you like. I’d like to see a taste-off of some of the lower-priced wines. Maybe someone could sneak in some 2-Buck Chuck and/or boxed wine poured into a bottle! Forgot BBQ? I don’t think I can read your blog anymore, Maggie, Sorry. We’ve done the traveling (or progressive) dinner in our neighborhood before, and had a blast. Love the idea of the wine and cheese tasting party! We’ve done dinner parties where some guests bring a starter and other guests bring dessert and we provide the main. Works out so much cheaper and means you’re not spending your life in the kitchen preparing all day!